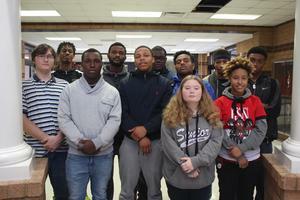 Between Thanksgiving and Winter Break, nine students from Cheraw High took advantage of a new opportunity provided in partnership with Northeastern Technical College. This year, students who are at least eighteen years old can participate in a lift-truck (forklift) certification program. Over a three-week period, these students went to NETC during “Tomahawk Time.” Tomahawk Time is a 65-minute block of time where students eat lunch, receive instructional services for both enrichment and remediation, participate in various clubs and organizations, and embrace some of the extra-curricular activities offered by the school. The first week of the program took place in a classroom as the students reviewed safety protocols and the basic operations of a forklift. The students then had to pass a paper and pencil exam which demonstrated they were familiar with the components and procedures when working with a forklift. The next two weeks of the course were focused on performance in the seat of the forklift. Without missing a single class period during the traditional school day, the following students received certification. The students who received a class 1, 4, and 5 certification on lift truck operation from Cheraw High are: Sylvester Simms, Jackie Jones, Robert Gillespie, Robert Hinson, Randy Toney, Tianna Boatwright, Shalik Josey, Dashon Stewert and Daiquan Campbell. The goal for these students is to gain employment locally operating a forklift.